With its sunny, soaring commons, high-tech learning labs, flexible format classrooms and collegiate-style gathering and collaboration spaces, the new Alexandria High School is open, indeed. The new, 283,000 s.f. grade 9-12 facility opened its doors September 2, 2014, two years after breaking ground for construction and more than ten years after beginning a long and thoughtful process that has engaged the imagination and support of an entire community. The new building replaces the former Jefferson High School, which has served the district since 1957. After a number of additions through the years, Jefferson was no longer performing to the level students deserved, said Trevor Peterson, director of business services for Alexandria Public Schools. “Space was an issue, and a lot of other things, infrastructure, just like any other building creeping up on 60 years old,” Peterson said. Jefferson’s long, narrow hallways were overcrowded during class shifts. Stairs limited mobility. Classrooms were one size fits all. There was wasted space, but an absence of gathering space. Aging boilers, ductwork and electrical systems challenged climate control and classroom technology. The existing structure was landlocked and had little room for growing programs like special education, music, athletics and performing arts. A series of five “temporary” satellite classrooms were still being used 40 years after their construction. And the existing school could not accommodate 9th graders. The district had been looking at solutions to these issues for some time. In 2003, a district referendum proposed construction of a new high school, and moving elementary students from their (circa 1930s) school into the existing high school. That effort failed to pass, in part because it contained no long-term plan to replace the aging Jefferson school, said Peterson. In 2006, the district returned with a phased plan for a new elementary school and purchase of land for a new high school. That plan passed, and the elementary school opened in 2009. In 2010, as the Great Recession dragged on, the Alexandria District engaged Kraus-Anderson through an RFP process to provide accurate cost analyses throughout the building referendum process. For more than a year, KA worked closely with Cuningham Architects, the school and community user groups to create a shared vision and 3D model for “The World’s Greatest High School.” KA collaborated with the team through conceptual design and development of the plans for the school, working out a realistic budget of $70.5 million. A civic-minded citizen kicked off the effort, stepping up to purchase the existing high school building for $2 million. That generous act helped spur on an additional $4 million in pledges from members of the community, lowering the new referendum figure to $64.5 million. “That became a game changer,” said Peterson. The referendum passed, overwhelmingly, September 27, 2011 and construction commenced the following spring with a strong showing of Alexandria-area contractors on the team. “We took care to package our bids so as to maximize the opportunity for local participation,” said Chad Rettke, Kraus-Anderson senior project manager. Bid packages were also scheduled so as to allow the team to progress with earthwork, footings and steel work while other portions of the building were still in design phase, accelerating construction progress, Rettke said. Throughout construction, the community sustained its support in dollars and in material goods. Some subs loaned pieces of equipment. Other citizens came forward with enhancements such as acoustically-superior rosewood flooring and a grand piano, both donated to the school’s new music room. An activities group generated funding for a turf field. During construction a second bond was issued to offset some delayed pledges; and an additional $1.5 million in capital campaign funds were raised during 2013, enabling the district to fund additional items. A prominently-displayed community wall in the new school’s commons area acknowledges the grass roots support. Strong community support, additional funding and interest earnings allowed the budget to expand from $70.5 to $73.5 million, allowing for a size increase from 280,000 to 283,000 s.f., which was mainly used to accommodate additional bleachers in the auxiliary gym used for tournament seating. Located on a sprawling 167-acre site, the new high school accommodates 1,400 students. The building has two 3-story academic wings with 36 classrooms, 12 learning spaces for small and large groups, science labs, technology and engineering lab, art rooms, media center and special education classrooms. Resources emphasize both vocational and college preparation. A hands-on industrial and culinary lab space is now storefront real estate, showcased adjacent to the commons area—a far cry from the days when industrial arts were relegated to the back of the school. The entire building is designed to be a flexible learning environment. The school’s open environment and flexible, streamlined elements mirror popular design trends in corporate offices, including the use of DIRTT walls — modular wall panels that can be removed and replaced with whiteboard, tack boards, glass or opaque glass as needs change. Classrooms have tables and chairs on wheels—no desks—and room layouts can be rearranged in 60 seconds, said Peterson. “Instead of one size fits all, now function drives the form,” he said. Enrichment amenities include new athletic fields and a stadium, activities wing with a 5-court gymnasium, 1,000-seat auditorium, dedicated wrestling room, fitness lab and performing arts wing with dedicated music spaces, kitchen and cafeteria. 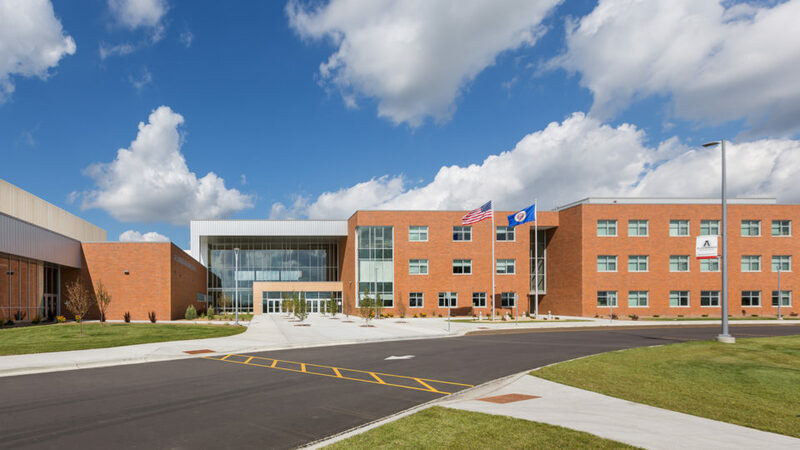 Built to LEED Silver standards, the school’s energy efficiency systems include abundant daylighting, reflective roof and a central HVAC control system enabling climate control from a single computer station. The new facility will also host activities and events for the public and community organizations. “Everything associated with this facility, and the community-driven approach that was taken has exceeded everyone’s expectations. The doors are finally open, and we can all look back and know we did this correctly. The community will benefit from this for many years to come,” said Peterson.